### / ## - ## or ### x ## - ##. These numbers can be found easily on the side of a tire, and on a label on the side of the driver's door. Different size tires may be interchangeable. The last number is the diameter of the wheel, and it must be correct to fit the tire. 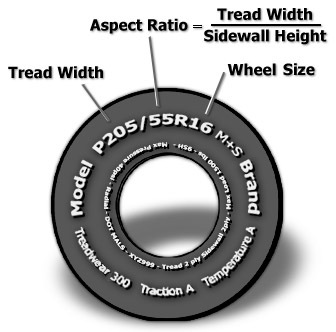 If the diameter (and circumference) of two tires is the same, they may be interchangeable. A change in the diameter of a tire will result in a change in the readings of the speedometer. You can compare two tire sizes with the Tire Calculator. It will display all the calculated dimensions of each tire. The calculator will help you estimate alternatives; then click "Compare." 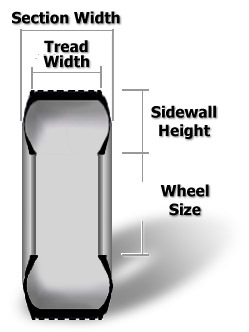 Some vehicles use different tire sizes on the front and rear. Check to be sure what is used on your vehicle. It is a common to purchase wheel upgrades and select sizes that are different from the wheels supplied by the manufacturer. If you plan to install wider tires, check first to see if wider ones will rub on the fender or suspension parts. There are also practical limits for tire widths and wheel rim widths. This version was uploaded .